Is content king of social networks? I have just finished Hitwise’s “The Impact of Social Networking in the UK“, and as I thought it is well worth a read (although it didn’t actually appear in my inbox until lunchtime today). Whilst I would agree with most of the report’s predictions for 2008, especially the growth in the role of social networks for marketing and the increase in specialist social networks, the report didn’t particularly address the issue of content. By which I mean the quality content of the music, film and television studios, rather than the strange things that pass for humour amongst the user-generating masses. The general social network that successfully ties up the rights for their users to share music and video seems likely to take the spoils, and a successful new entrant could quickly usurp the market leaders. The music rights secured by Imeem are likely to have been a major contributory factor in the social network’s massive growth over the last year, and that these rights are only for the US helps explains the network’s missing from the top 25 UK social networks. Whilst the growth seems to have slowed of late (at least according to alexa and google trends), music rights are not likely to be as enticing as video rights. People want to listen to music on numerous different platforms, whereas television programmes are usually only watched the once. Whilst I have tired of Facebook, I could be persuaded to return on a more regular basis if I got to do the social stuff whilst watching quality TV programmes. Whilst I am still awaiting the actual white paper to appear in my inbox, it is probably worth having a look at (with a seemingly painless sign-up process). Am I the only one surprised at the continued interest in Facebook? Whilst the film download options for Americans seem to be constantly improving, the UK is miles behind. It feels as though I spent the whole of the weekend searching for a decent legal web site, all to no avail. You either have to buy the download-to-keep (which is usually more than it would cost for the DVD), or you have an EXTREMELY limited range of films available. Yes the UK’s online TV is great, I love the iPlayer, 4OD, and streaming episodes of metal mickey on ITV, but where is the UK’s Amazon unboxed equivalent? This is all made much worse by the fact that during my search I was constantly coming across sites where I could get illegal copies for free. If film companies don’t want people pirating copies of films, they need to make official copies available ASAP at a reasonable price. If anyone does know of a good legal UK site I would be pleased to hear about it. 1. 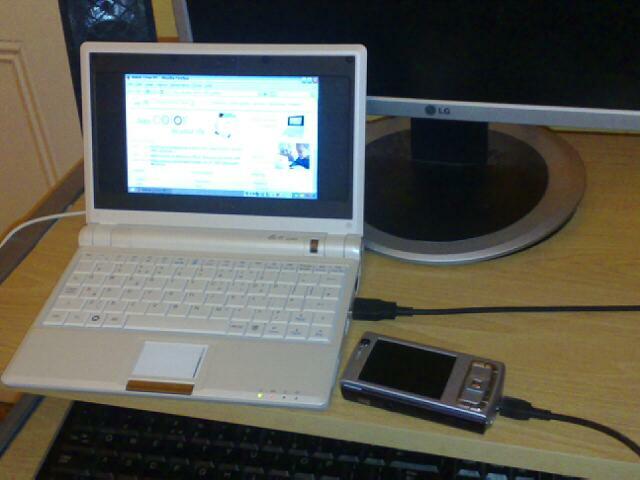 Enable accessing the full-desktop mode on your Eee PC. Whilst it is suggested that you need to be “fairly comfortable at the linux shell prompt” when it comes to adding the N95, everything you need to do is fairly intuitive. How on earth did we manage before people posted everything online? nb. obviously if I suddenly find I have a bill for hundreds of pounds I will change the post accordingly. It is worth noting that whilst I upgraded my plan online, I had to phone T-mobile to get the upgrade today rather than on my next billing date. It is difficult to over emphasise the importance of RSS feeds to the information professional, and I am always shocked when I come across someone who doesn’t use them. Until now I have been happily using the web-based Bloglines, with my only criticism being the regularity with which it checks some of the feeds, and that I have never found their mobile service to be particularly user friendly. Whilst others have since transferred to Google’s Feed Reader, personally I like to keep my web services in more than one basket. However, with NewsGator now offering their mobile, web-based and downloadable aggregators for free it is definately time to consider a change. First impressions are very favourable, although whilst the additional features of FeedDemon are no-doubt useful, I do find myself missing the simplicity of the Bloglines. Only time will tell if NewsGator has enough to make my temporary change permanent, and the key may be the quality of the mobile reader. I have previously mentioned MessageDance, a service which allows you to embed a widget on your blog or web site which visitors can post messages to via email, but didn’t have access at the time. Whilst I finally got my invite to the service last week, I have not had the opportunity to blog about it until now (have I mentioned the fact every waking moment has been spent on an appallingly written PhD?). Whilst I still like the idea of MessageDance, I think it requires too much work on the part of a message poster to be worthwhile embedding. If someone attempts to email a message to a MessageDance account, they receive the following message by return post. The MessageDance user you are sending a message to (webometrics) does not have you in their accepted friends list. In order for you to send them messages, you need to be a registered user of MessageDance and webometrics has to agree to accept your messages. On my blog I want people to be able to email me comments without having to join a service they may have no interest in using again. Yes, this opens the service up to spam, but I should have the option of taking that chance, and vetting the comments before they are posted if I choose. Good services grow because of the quality of the product rather than forcing customers to join. If MessageDance changed this aspect, I would happily embed the widget at the earliest opportunity. The most anticipated launch of the year so far was the Wikia Search Alpha on Monday (although with the PhD calling I had to force myself to ignore it until today). Whilst I welcome the idea of a transparent search engine, and hate the dominance of Google in the English speaking world (such a monopoly is not in the public interest), I am unsure how well the wikia search project will work, or even if I want it to succeed. 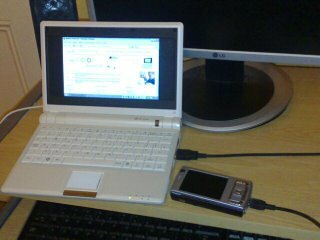 Search engine transparency appeals to me both as a regular search engine user, and as a webometrician. I broadly agree with Wales’s awfully worded sentiment that “sunlight is the best disinfectant”, and access to crawling and ranking data could allow webometricians to have access to larger crawls of the web without compromising our understanding of where the data comes from. However, I am not a big fan of human-edited directory approach. Wikia, like Mahola before, have decided to mix-up what we used to label directories and search engines, and create human-edited search engines, where for certain searches the search engine results include a human edited article on the topic. Whilst Mahalo pays people to create these articles, Wikia will allow any user to add to an article, in the true wiki spirit. But whilst you may be willing to contribute to a wiki article for the good of the community, would you be willing to continue doing this when the money starts to roll into Jimmy Wales’s pockets? Wikia Search is a commercial venture. Whilst human edited search engines may have their place in world of search, they appeal to the generalist rather than the specialist. Pages for the iPhone and Heroes will quickly appear, but I can’t imagine people will still be jumping on-board with enthusiasm if they starting seeing Wales get rich, and such a search engine needs mass participation for it to be of any use for those interested in more than the latest Paris Hilton gossip. In a perfect world an individual would have the opportunity to personalise a search engine’s ranking system to their own requirements, preferably for each specific query, varying the effects of different features according to the sort of data that was required, e.g., links, keywords, anchor text, domains. However, such personalisation is still a distant dream. 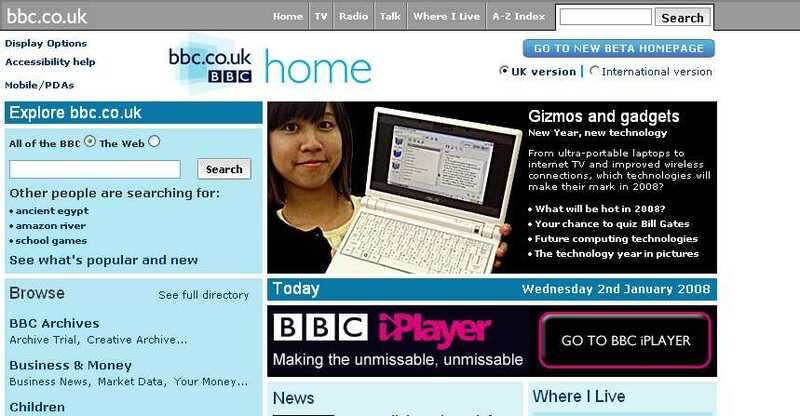 When you hit the front page of the BBC, you know you have made it big, whatever PC Mag says.